Interview: David Todd, author of "Documenting America: Lessons from The United States' Historical Documents" | Redeemed! Though originally from Rhode Island, David Todd is currently a resident of my home state of Arkansas. David and I met online, in a book agent blog, where we discovered that we both are licensed professional civil engineers who also enjoy writing. David describes himself as, “a civil engineer by profession, a genealogist by avocation, an environmentalist by choice, a lover of history by experience, and a writer by passion.” He has recently published a book titled, Documenting America: Lessons from The United States’ Historical Documents, in which he shares his love of American History with his readers. I have invited David to tell us a little about this book. Redeemed: David, why did you decide to write Documenting America? What are you communicating in this book that readers won’t find in typical American History textbooks? DT: Ten years ago, in a thrift store, I came across a 20 volume set of The Annals of America, an Encyclopedia Britannica publication. It contained long excerpts from a wide variety of American documents. I bought the set and began reading through it. One of the first ones I read was James Otis’ speech arguing against the Writs of Assistance in 1761. I was amazed at what he wrote, and found themes that later showed up in the Declaration of Independence. I thought, “If that was covered in my history classes, I missed it.” About the same time our local newspaper began a guest op-ed program. So I wrote an op-ed about the Otis speech, and the newspaper published it. They later published three others based on the same theme: historical documents, and the lessons we can learn from them. So I wrote more of them, intending to shop it as a self-syndicated newspaper column. That didn’t work out, but eventually I had the idea to expand the columns and pull them together into a book. I also found American documents in many other places. I wanted America to have a glimpse into these wonderful pieces of our history, and fall in love with them as much as I did. Redeemed: David, in this book, you have included historical quotes by American men who were quite well-known and influential in their own time period, yet have not been included in most American History textbooks. How have you gone about finding these historical figures and documents? DT: You know, it really started years ago with that used set of The Annals of America, an Encyclopedia Britannica publication: 20 volumes of documents that chronicled U.S. History. Since then I’ve picked up other books along the way. Nowadays all of these things are available on the Internet, sometimes as scanned documents and sometimes as transcriptions. Redeemed: So what is different about Documenting America that would draw someone to read it, as opposed to other books on the topic of American History? DT: Well, it’s not a conventional history book. It’s not my interpretation of history so much as it’s an introduction to unfiltered history. Sure, I give something about the historical context of the document. And to entice people to read the document, I tie it to an issue in our nation today. But there’s not a lot of David Todd opinion in the book. Most of it is the documents telling their own story. Redeemed: Several times in this book you ask questions such as, “Why didn’t I learn about this document in History class?” Do you have an answer to that question? Why are so many of these historical documents excluded from American History textbooks? DT: I don’t think I ever slept through history class, as it’s one of my favorite subjects. Possibly it’s the sheer volume of documents available. Possibly it’s a bit of tunnel vision on the part of those who write the history textbooks. They have so much to choose from they over-concentrate on the better known documents. It might also be a case of the historians falling in love with their own words and thus not having space for the text of the original documents. Redeemed: Give us one example of an important document included in Documenting America, which might be easily overlooked by history students. DT: In 1816 Thomas Jefferson wrote a letter to a Virginia colleague, Samuel Kerchival, about proposed changes to the Virginia constitution. In this letter he included opinions on a wide range of constitutional and governmental issues, applicable to the Federal Constitution as well as to the State. I enjoyed this letter so much, and learned so much from it, that I dedicate three chapters to it. This is just one of tens of thousands of such documents that can teach us. Redeemed: In reading Documenting America, I get a sense of a depth and richness to the development and definition of the United States of America that includes more input by more people across more years than what most of us learned in school. However, you also end each chapter with provocative questions regarding how well we are, or are not, guarding American liberties, today. Do you see our country as being on a continued upward spiral on a broad, stable foundation, or do you see our country more as being in a period of decline from the greatness it once held? DT: Well, you’re asking me to get into opinion there, not necessarily related to the book. I’ll say that I see the USA as being a fragile experiment. Yes, after 236 years we are still in the experimental phase, testing whether a nation “dedicated to the proposition that all men are created equal”, and to allowing those men to govern themselves, can long survive. I wish I could say I was optimistic that we will long survive, but I am not. Redeemed: What specific time period of U.S. History does Documenting America cover? DT: Rather than cover a specific time, I purposely tried to have a wide range of years represented, to show how rich our historical documents really are. Be it 1650 and the Pilgrims, or 1895 and a partisan senator, these documents have something to teach us. In hindsight, I have the period from 1783-1817 over-represented. That was not on purpose. I suppose, if I write other volumes of this, having shown that the full range of documents should be explored, I’ll then concentrate on a specific era per volume. Redeemed: You said that the period from 1783-1817 may be unintentionally over-represented. Yet, there must be something that drew you to this particular era of American History. Do you see this particular time period as being more formative of the developing perceptions of how Americans have come to view ourselves and our country? DT: I think it’s because, perhaps, this period in our history may be a bit under-represented in history text books. The Revolution (1775-1783) itself gets a lot of pages. Development of the Constitution (1787-1789) gets a lot of pages. But I don’t remember much discussion of the periods between and right after them. So I suppose I gravitated to the documents of those eras as much to educate myself as to write the book. Redeemed: When people read Documenting America what do you hope they will come away with? DT: I hope they will say, “Oh, I never read that before! What a great document! Why wasn’t that covered in my history classes? I’d better find and read the whole document.” If people will find and read the original documents, I will have succeeded. Redeemed: Having studied these historical documents and written this book, what single point of concern do you see as being most threatening to American liberties, today? What one piece of advice from these historical documents would you most like for Americans today to hear and heed? DT: I suppose it’s that our people have learned, as Benjamin Franklin predicted, that they can vote themselves a payment from the treasury. That’s one small step to going broke. Another concern I have is that we learn our history through textbooks, not through the original documents. Thus we learn it through the biases of the textbook writer. People say we ought to do what the Founding Fathers wanted without have a real clue as to what the Founding Fathers said. Maybe, in a small way, Documenting America will change that for a few people. 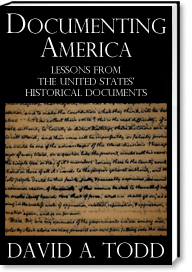 For more information about David Todd’s book, “Documenting America: Lessons from The United States’ Historical Documents” click here.